John Wilkes Booth killed President Lincoln with a shot in the back of the head near his left ear. This pistol was the weapon he used. Manufactured by Henry Derringer, this .44 caliber is about 6 inches long with a 2 1/2 inch barrel and only weighs 8 ounces. The weapon was found on the floor of the State Box in Ford’s Theatre after the assassination, but it located today in the basement of Ford’s Theatre. This cute little pistol may be small, but it surely packs a punch! After all, it has proven itself in the past.Load: 15 grain black powder .019 lubed patch .440 128gr. round ball. According to one source, the murder weapon was stolen from Ford’s Theatre one hundred years after Lincoln’s death. 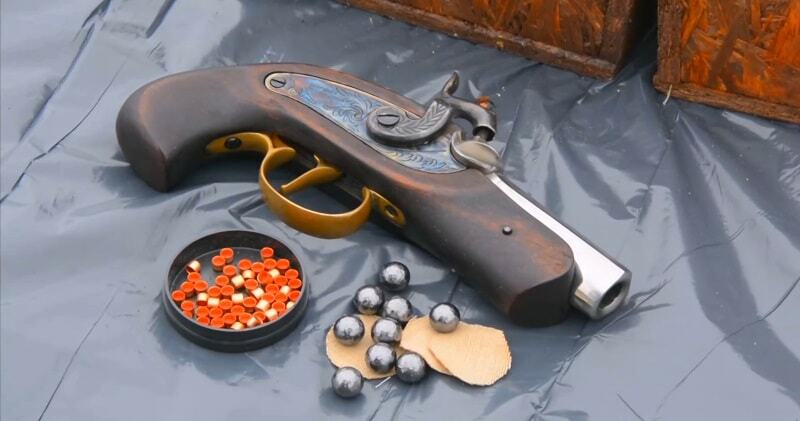 The original Philadelphia Deringer was a single-shot muzzleloading percussion cap pistol introduced in 1852, by Henry Deringer. In total, approximately 15,000 Deringer pistols were manufactured.All were single barrel pistols with back action percussion locks, typically .41 caliber with rifled bores, and walnut stocks. The Gun That Shot Lincoln Boxed Set is a novel little historic piece that recreates the pistol that killed this great American president. President Lincoln is best-known for his role in leading the country during the American Civil War, which eventually resulted in the freedom of slaves in the southern states.